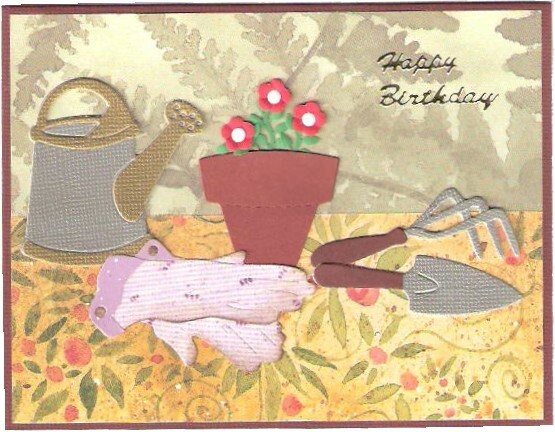 Here is a perfect birthday card for a gardener. By layering silver and gold watering cans, I was able to make the different parts of the watering can stand out. The brown handles on the hand rake and trowel make them look more true to life. I also layered the prongs on the hand rake to give it a 3D effect. The gloves are also layered, and to make the gloves look like they had been put to use, I added a little distressing ink around the edges. The flowers in the pot are small, indicating that they have just been planted. The only thing missing from the picture is the happy gardener, who is taking a well deserved coffee break.